Home » Things to See and Do • Tourism » Wolf Rock Dive in a fever! Wolf Rock Dive in a fever! Wolf Rock sets of the new year in style with epic sightings of large fevers of rarely seen cow nose rays and mating eagle rays caught on camera! The site at Wolf Rock is going off this month with crystal blue water up to 30m visibility. The site is pumping with around 50 grey nurse sharks on the site daily and large groups of different rays hovering around in the blue. 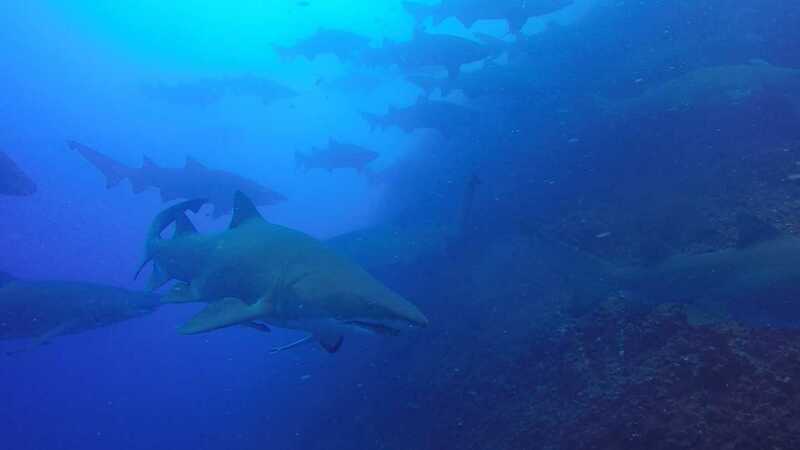 Divers have witnessed not only grey nurse shark mating behaviour, but also a mating dance between two eagle rays. Leopard sharks are in high numbers and despite the wind and large swell over the past few weeks the site has been glorious, well worth a visit. Our locals open water course started off well with all theory, pool sessions and two dives on the boat completed. Our students dived at Round Rock off Double Island point and saw leopard sharks, reticulated rays and shovel-nose rays – not bad for their first ocean experience on scuba!